OCEANFRONT 4BD/3BA 2,005 SQ. 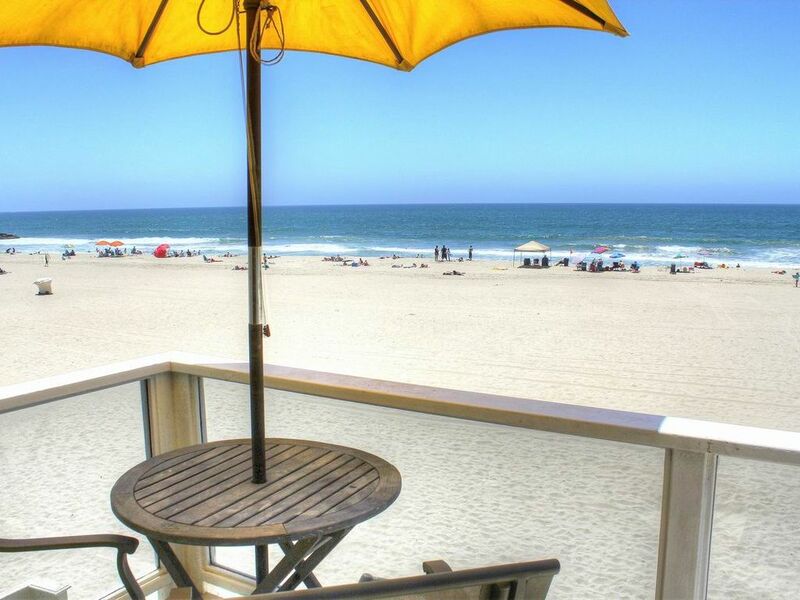 FT. 2-STORY TOWNHOME ON THE SAND.WITH NO BOARDWALK BETWEEN THE BEACHSIDE PATIO AND THE SAND. IT SITS IN A GENERAL LOCATION WHERE THE HOMES ARE AS CLOSE TO THE WATER AS POSSIBLE ALLOWING FOR THE BEST WATER VIEWS.THE BUILDING CONSISTS OF 2 SIDE-BY-SIDE TOWNHOMES WITH NO ONE ABOVE OR BELOW.THE BEACHSIDE PATIO IS NOT SHARED. 4-CAR PARKING PROVIDED. THE MASTER BEDROOM IS OCEANFRONT ON THE 2ND LEVEL WITH GREAT VIEWS OF THE SAND, JETTY AND WAVES. THE MASTER BATH HAS A 2-PERSON WHIRLPOOL TUB AND SEPARATE 2-PERSON SHOWER. 4-CAR PARKING----2 BEHIND GARAGE DOOR AND 2 IN FRONT. 1ST LEVEL OF THE TOWNHOME IS ELEVATED ABOUT 4' ABOVE THE SAND ALLOWING FOR BETTER WHITEWATER AND BEACH VIEWS FROM THE LIVING AREAS. THE M. BEDROOM IS OCEANFRONT ON THE 2ND LEVEL. IN AN AREA WITH NO BOARDWALK BETWEEN THE OCEANFRONT HOMES AND THE SAND. HOMES IN THIS STRETCH OF BEACH ARE AS CLOSE TO THE WATER AS YOU CAN GET. We were there for a family wedding. The place was perfect for us our adult childern and granddaughter Beautiful views and loved the beach access! Good parking and easy to find. We had an amazing time! Everything is there that you need. Hope to go back. Well designed and implemented home away from home! This property was amazing! The view from both patio and the balcony, off of the master suite, was so relaxing and enjoyable. Drinking hot tea and watching the waves roll in was tranquil in the early morning. We loved being able to walk off the patio directly onto the beach. The inside of the property was very comfortable and made you feel at home. Pat was very accommodating and easy to work with. Wonderful area with a lot of eating and drinking establishments within walking distance. Our family of eleven had a wonderful time in this beautiful home. Super clean and spacious. If you’re planning on doing any baking take your cake pan or cookie sheet. This place is perfection and we will definitely be back. Lovely property, fabulous view, very clean! The floor plan is nice. The downstairs is very open and one has the gorgeous view from the front door to the slider to the beach. Upstairs master is stunning! LOCATED AT 44TH ST., APPROXIMATELY 3/4 OF A MILE NORTHWEST OF THE NEWPORT BEACH PIER AND ABOUT 2 MILES FROM THE BALBOA PIER. GOOD SURFING AND BODYBOARDING DIRECTLY IN FRONT OF THE TOWNHOME. THE NEWPORT BAY IS 2 BLOCKS TO THE EAST. A STRIP CENTER IS 3 BLOCKS AWAY WITH A CONVENIENCE STORE AND RESTAURANTS. BIKE AND SURFBOARD RENTALS ARE IN THE AREA.